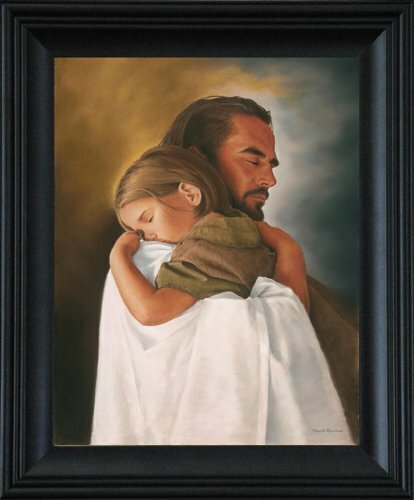 Artist David Bowman's "Expressions of Christ" series captures the love of our Savior in an up close and personal way--One of the greatest human needs is a sense of security. In all aspects of life, we naturally gravitate towards anything that makes us feel safe. In this piece, I wanted to convey a sense of complete peace and calm like only the Savior can provide. It's a security that allows us to rest assured, without fear or worry, when we put ourselves trustingly in His arms. Little children have that inherent kind of trust in their parents, so it's fitting that the man and girl who modeled for "Security" are actually father and daughter. They generated the exact feel I was looking for. Description included on the back of each purchased piece. 16"x20" print in a 2.5" frame- total 21"x25"
Real wood frame (made in the USA). Signed by the artist & ready to hang! Framed Art Print, 'John Wayne' by Bob Willoughby: Outer Size 24 x 32"